It would appear that I am going to live, though I'm still not sure if I'm ok with that. I always know I'm sick when I find myself just holding my knitting instead of working on it, and last night I didn't even bother to pick it up. 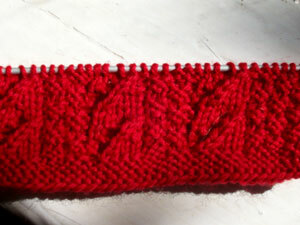 This morning though, I feel slightly more alive and my will to knit is restored. 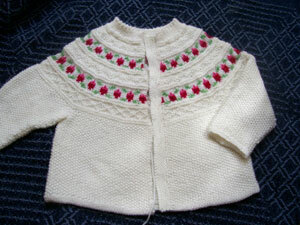 This is the first of the baby sweaters for the girl/boy set arriving soon. It's Rutelilje from this book. It's blocking now, despite only having one button band knit on, but I suffered a crisis of faith when the one buttonband didn't lie flat in it's pre-blocked state. I decided to block it before I knit the other one so that if it turned out to be badly wrong I would only have to rip back one. Turns out that after a very gentle blocking (It's still wet in that picture) that it's right after all. (I chalk this lack of confidence up to the fever and a general suspicion of all button bands.) 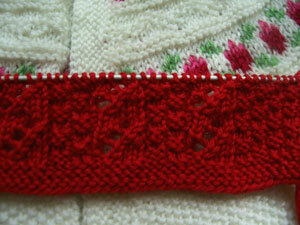 When it's dry I'll knit the second one to match and re-block the who shebang. While I'm waiting for it to dry I started the sweater for the boy. This is Erle, from the same book. It's an eyelet pattern faux cable, interspersed with double moss, and I had been convinced (until I started knitting it) that it was quite manly. Now I'm wondering if it's only the flu that's letting me put the word "eyelet" with the word "manly". Is this sweater too feminine for a boy? This leads, naturally, to all sorts of questions about gender, gender roles and expectations and what exactly I think would be wrong with someone who weighs seven pounds wearing something a little bit girly. I like to think that I treat boy babies and girl babies the same, and that we (as a culture) don't raise girls and boys differently, but it says something that even as I attempt to be enlightened about these things that I still apparently think, on some level...that it's important to be able to tell the difference between a boy and a girl based on what they are wearing. Thinking further about that (and remember...I do have a fever, so it's possible that none of this actually makes sense) the only reason I can think of that I would want boys dressed "like boys" (whatever that means) is that I do treat them differently and worse than that, does it mean that I think that a baby could be influenced by the stuff they are wearing? I'm pretty darned sure that we've advanced far enough as a civilization to let go of the idea that putting a baby boy in a lace sweater could influence his gender identification, especially since he's not old enough to have any idea what sort of sweater we've plopped him into. I keep thinking about that study a few years ago where the researchers took a bunch of babies and dressed them all like girls. Then they asked strangers to interact with them. The adults assumed (because of the clothes) that the babies were all girls. When the handled them they did so gently, and used words like "pretty" and "fragile". Then the researchers took the same babies, dressed them as boys and repeated the experiment. This time, the adults played rougher games with the babies and called them things like "strong" and "smart". Overall, the adults assessed the "boy" babies (who were really boys and girls) as healthy and competent, and the "girl" babies as "tiny" (even though they were the same babies) and "beautiful". It made me wonder how many assessments I make about babies based on their gender, and how I treat them without even thinking about it. Ideas? Thoughts? Do you shun lace for boys? If so, why? Do you hold hard and fast to the ideas of girl colours and boy colours? How come? Should we be passing over lace for girls as well? How much do gender relevant clothes matter....and why?